Add 6 Syns if not using Wholemeal bread as a Healthy Extra on Extra Easy. Add 4.5 syns if using Gluten Free Cornflakes on Extra Easy. For the curry sauce - This makes loads, there are 3 of us and it did 2 meals, I saved the leftover sauce in a sealed jar in the fridge. Spray a large heavy-based saucepan with low-calorie cooking spray. Add the onion, garlic and ginger and cook for 3 minutes or until the onion is softened. Add the carrots and courgette and lightly fry for a further 4-5 minutes. Add the turmeric, cumin, coriander, chilli powder and sweetener and evenly coat the vegetables. Add the stock, soy sauce and bay leaf and bring to the boil. Reduce the heat and simmer for 30 minutes. While the sauce is cooking, preheat your oven to 200°C/180°C Fan/Gas 6. Season the breadcrumbs with salt and freshly ground black pepper. Place each chicken breast in some clingfilm and flatten with a rolling pin or meat tenderiser. Remove the clingfilm and dip the chicken in the egg, then coat with breadcrumbs and place on a baking tray sprayed with low-calorie cooking spray. Bake in the oven for 15-20 minutes or until the chicken is cooked through. 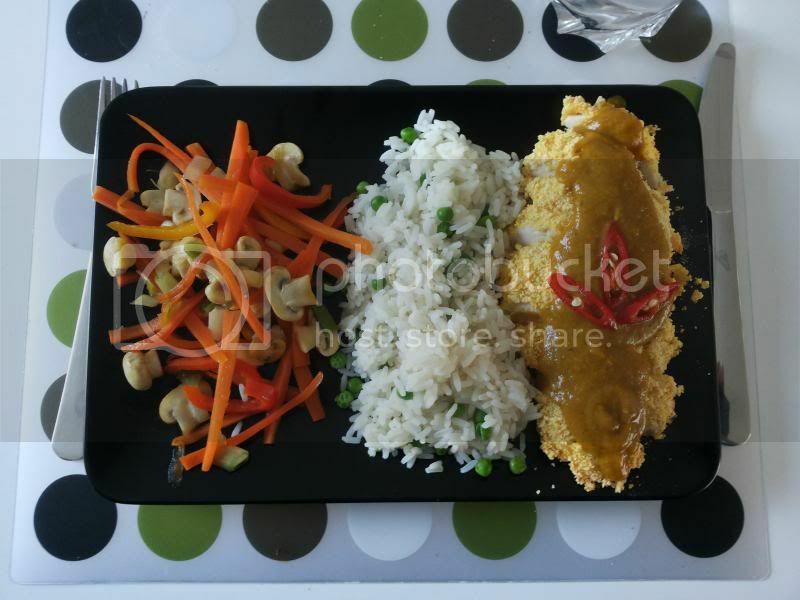 To serve slice the chicken breast into pieces, spoon over the curry sauce and serve with steamed jasmine rice. Oh my gosh, this looks so tasty! I'm always on the lookout for a good curry recipe as it's one of the rare things both my daughters will eat without complaint. How hot is it? I'm guessing that I could adjust this by leaving out the chilli powder? It's not terribly hot Ruby, I think kids can find the ginger a bit much so I put a little less in for my daughter's sake and I used just a touch of cayenne (only had chilli flakes in the house) but you could definitely leave it out I think. Most kids I know really like this, as with the sweetner it has a bit of a sweet taste. Cannot wait to try this, might try Katsu aubergine as not a big chicken fan! Chicken Katsu is my partners fave, but I've refused to go wagamamas! Is this helpful for diet persons ? Find more posts on chicken, curry, katsu, website.